Currently browsing posts filed under "Williamstown"
A wonderful round-table of reminisces about Williamstown. EphBlog Maxim #9: The best way to predict the behavior of Williams is to imagine that the College is run by a cabal of corrupt insiders who seek to use our endowment to better their own lives. Of course, this is not true! Tiku Majumder is a good guy! Steve Klass is competent and charming. But they sure find a lot of strange places to spend money . . .
Williams College has announced a $400,000 gift to the town to help build the new police station on Simonds Road. With college Assistant to the President for Community and Government Affairs James Kolesar in the audience, Town Manager Jason Hoch told the Select Board on Monday that the school’s gift will make it easier to achieve his goal of renovating and expanding the former Turner House on Simonds Road (Route 7) without adding to the town’s property tax rate. 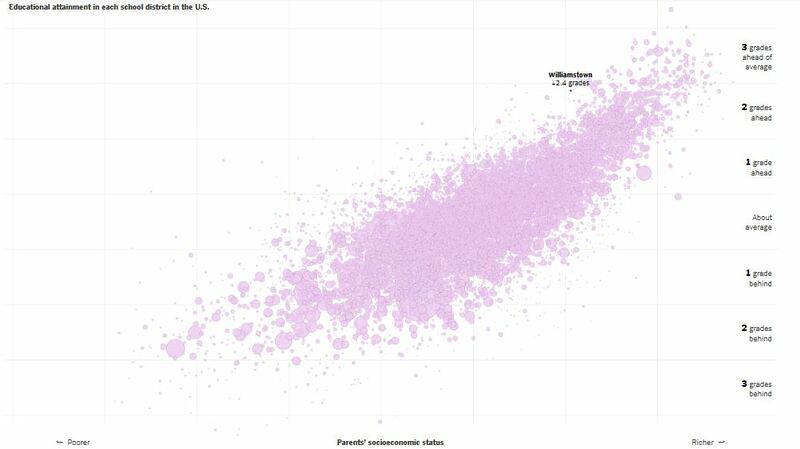 Williamstown is a richer than average town in a richer than average state. Why should alumni fund donations go to pay for its new police station? If the good people of Williamstown want/need a new police station, then they should pay for it themselves. Then again, that might require that Tiku Majumder or Steve Klass or Jim Kolesar face an increase in their property taxes and we wouldn’t want that, would we? Williams already spends $500,000 on local charity each year. Is this $400,000 in addition to that? The $1 million we gave to North Adams Regional Hospital. By the way, NARH has since closed, so that $1 million was (completely?) wasted. Was anyone at the College challenged about that? No! No effort to give away alumni money is ever a failure at Williams. The $250,000 we gave to the local high school back in 2003. This was just a part of the hundreds of thousands (millions?) 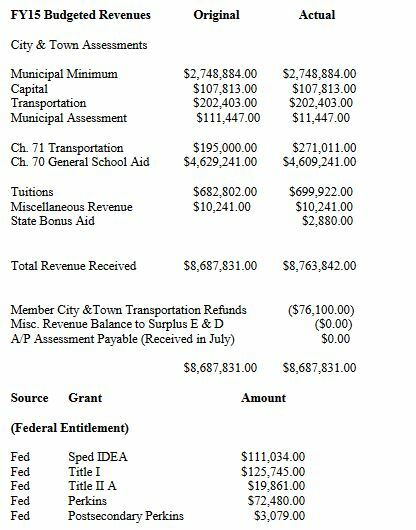 of dollars we have spent to subsidize public education in Williamstown. The $2 million to MASS MoCA in 20007, right before the finacial crisis forced us to cut financial aid to international students. The $200,000 for “rebranding” for the local ambulance service. And on and on. I don’t know what the future will bring exactly, but you should bet that the College will spend millions of dollars over the next few years on items that, in every other town in the lovely Berkshires, the local residents provide for themselves. That’s how Charles Bonenti described how the late Dagmar Bubriski, his former colleague on the Williamstown Historical Commission, would react if she knew her 19th-century home at 42 Hoxsey St. may well be torn down at the behest of its present owner, Williams College — the very entity she had refused to sell the home to during her lifetime. Dagmar’s daughter, Wanda Bubriski, said she knows the college’s interest in buying the property had gone on for more than 50 years. But Wanda didn’t expect the college would tear it down — even though her mother did. Dagmar and her husband Stanley moved into the home in 1954. After Stanley died in 1965, Dagmar raised four children in the home. An informed crusader on civic issues, Dagmar was also a perennial face in the audience at selectmen’s meetings and a frequent letter-writer to the North Adams Transcript regarding a wide range of Williamstown issues. An advocate for historic preservation, Dagmar helped lead ultimately unsuccessful fights to preserve the Williamstown Opera House and various other properties owned by Williams College, according to her obituary in The Eagle. EphBlog, sadly, only wrote about Dagmar once. Shame on us! The Record wrote this wonderful story in 2002. Hemmed in by the college’s Bronfman Science Center following the center’s initial construction in the 1960s, Dagmar’s own home motivated her historic preservation efforts. The taller, 90,000-square-foot brick science center is set to be demolished this year to make room for an updated science complex. It looms over the yellow Victorian that Dagmar called home. “This is just one more step in the institutionalization of the village center,” said Bonenti. Indeed. The College has always been the most important institution in Williamstown, but its power, relative to town residents, seems to grow stronger each year. The college’s expansion also undermines the town’s architectural diversity, he said. Buildings that were homes like Dagmar’s are being overshadowed by the college’s new buildings — largely “institutional, bland, generic boxes,” he said. For years, Hoxsey Street was a residential neighborhood filled with family homes like the one Peter grew up in, he recalled. Now, it’s been taken over for the college’s needs, he said. 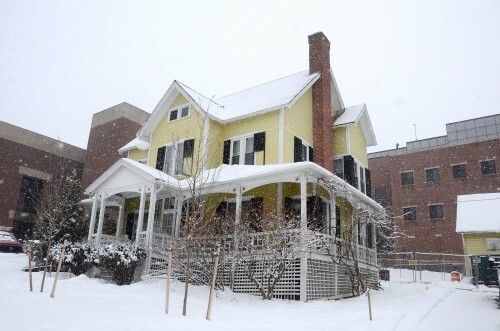 Besides the Bubriskis’ former home, the college owns five other buildings on Hoxsey Street — two faculty-staff rentals, two student residences and one building that houses academic offices that will be converted into another faculty-staff rental, said Jim Kolesar, assistant to the president for community and government affairs at Williams College. Presumably, Kolesar (rather than Jim Reische) got involved in this article because he had been sparing with Dagmar for years. I have no problem with the College owning lots of buildings. Indeed, I think we need more home-like structures so that we can dramatically increase the number of co-ops. But it is absurd how many rentals the College maintains for staff and faculty. What a waste of resources! The College needs to house students. It does not need to house faculty/staff. The college also owns and maintains more than 75 buildings in town that are at least 100 years old, Kolesar said. “The college has torn down a number of structures,” said Andrew Groff, community development director for Williamstown. “But I would not characterize them as being a poor steward” of historic buildings. The college has invested in historic rehabilitation of buildings, he said. When Wanda sold the house to Williams College in 2017, the college told her it would be used for office space during construction and later for faculty housing, she said. She said she now believes the college was simply telling her that so she would sell. D’uh! Of course the College was telling her whatever she wanted to hear. But, that said, Wanda could have driven a harder bargain, could have inserted a provision that the College could not tear down the house for 100 years. She choose not to do that, probably because it would have lowered the price she and her brothers received. I wonder if Dagmar thought about including a relevant stipulation in her will . . .
Kolesar said the college intended to use the house for those purposes. After efforts to move the home failed to pan out earlier this year, the college now plans to demolish the building. In a letter sent March 12, Wanda, her brothers and about 97 other people signed a letter to the president and trustees of Williams College and the Williamstown Historical Commission urging the college to reconsider its decision to tear the building down. Does the College archive the letters it receives? I hope so. Better yet would be to scan them and make them (or most of them) public. On April 12, the town’s Historical Commission will take up the matter. The commission has the power to delay the demolition for up to a year. If the commission chooses not to delay, the demolition could go forward right away. Removing the building will facilitate the construction of a new science center building — a core educational priority for the college, according to a Jan. 31 letter from the college’s lawyer to William Barkin, chairman of the Williamstown Historical Commission. Removal will also allow the college to enhance the landscape along Hoxsey Street with more plantings and a geologic rain garden. It will also enable the college to improve underground utility and stormwater management and relocate a small parking lot to a location that will be more sensitive to the college’s neighbors, according to the letter. Over the last four years, the college has moved two houses and a barn, facilitated the moving of a third house and has taken down four, Kolesar said. The college listed the property as available throughout January and February, seeking parties interested in moving the building off the current lot, Kolesar said. The building was free, with the interested party taking on the cost of moving the home. The offer expired Feb. 28. The college received about 17 expressions of interest, Kolesar said. He recalled there was an entity that was “very serious” about the project, but ultimately backed out. “In the end, they felt that they couldn’t pull it off,” he said. Perhaps they could put up a plaque to commemorate Dagmar and her defense of town against gown over the years? 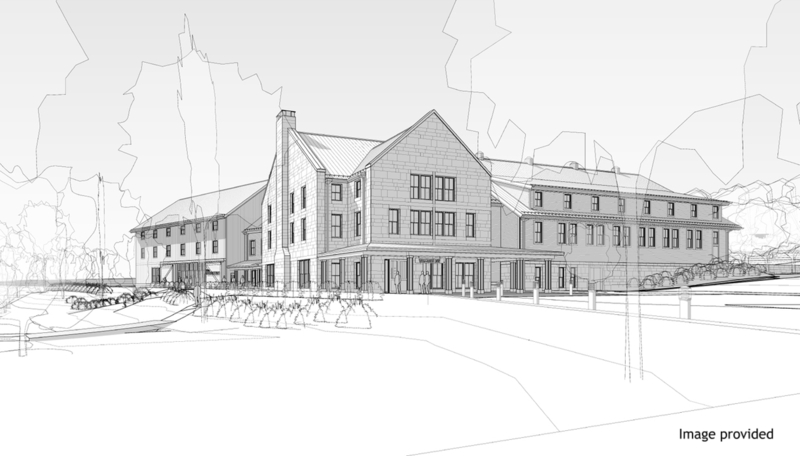 On Thursday night, Williams College received the final regulatory approval it needed to build a 64-room, 60,000-square foot inn at the bottom of Spring Street to replace the current 100-room inn at the Field Park rotary at the junction of Routes 2 and 7. I was talking to an administration official a few years ago about this project. He claimed that the reason it was needed as that “Spring Street was dying.” That was (and is) absurd. Spring Street has never been more vibrant. And, to the extent that it is “dying,” that the small merchants who used to sell school supplies and newspapers are disappearing, it is because Williams has been raising their rents for years. The real reason for the Williams Inn is that it will be great for rich people. (Not that there is anything wrong with rich people!) If you were, for example, a trustee, the lodging situation at Williams has been problematic for 30+ years. The old Williams Inn is decrepit, probably the worst hotel that you have ever stayed at. The Orchard is adequate but it is too far away from campus. You usually bring your spouse for trustee meetings, but you travel in one car. Then, either you have an annoyingly long walk to campus for your meetings, or you drive and leave your spouse stranded at the Orchards without a car. Not good! The new Williams Inn solves those problems. It will be plush. It is as close to campus as possible, allowing you to walk to all your meetings while your spouse keeps the car to explore the local region. I am not claiming that anyone on the Trustees ever discussed these issues out loud. But I guarantee that they all thought about it. 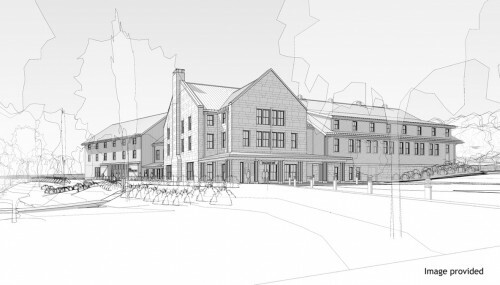 If the Record were a decent paper, we would have a lot more detail on the costs involved with this project, including the costs associated with the purchase of the old Williams Inn. It isn’t, so we don’t. Still, I am in favor of the new Williams Inn. First, it will be very convenient for all us rich guys. Rich Eph Lives Matter Too! Second, it is probably a good idea for Williams to make any visits to Williamstown for major donors as pleasant as possible. My sense is that our peers all have first class hotels within easy walking distance of their campuses. Williamstown does not appear to be a sanctuary city. There was an interesting e-mail last week about the “Williamstown Immigrant Trust Act” which seems to, in all but name, turn Williamstown into a sanctuary city. In the United States and Canada, a sanctuary city is a municipality that has adopted a policy of protecting unauthorized immigrants by not prosecuting them for violating federal immigration laws and by ensuring that all residents have access to city services, regardless of immigration status. Such a policy can be set out expressly in a law (de jure) or observed only in practice (de facto). The term applies generally to cities that do not use municipal funds or resources to enforce national immigration laws. The cities usually forbid their police or municipal employees to inquire about a person’s immigration status or share such information with immigration enforcement. The designation has no precise legal meaning. 1) Am I correct that Williamstown is not currently a sanctuary city and that this act, if passed would turn it into one? 2) Does anyone have any insights into the local politics involved? Williamstown is overwhelmingly liberal and had fewer than 15% of its votes going to Trump. So, presumably, anything that goes against Trump would be popular . . . I think that this is just school-related revenues and that there are few other sources of state/federal aid to the budget. Would Trump ever start to take away education-related money from sanctuary cities? Would a loss of $400,000 make Williamstown rethink its stand? Governor Baker seems committed to keep the state government out of the discussion. That is good news for Williamstown since a withdrawal of state funding would cause chaos for its budget. But what happens when the Feds start to put pressure on the States? Imagine if Trump (and the Republican congress) decided to cut off funding to any state which insisted on giving its own funding to sanctuary cities. Is the new construction for the high school — and the tax free bonds that support it — a possible pressure point? Again, informed commentary from Williamstown residents wanted! Is there anyone “here” who can honestly claim that Hillary Clinton does not have a record as a hawk who has been involved in the escalation of war for decades? How can you legitimately claim the moral high ground of “peace love and understanding” when you voted for a war candidate? A vote for Hillary Clinton was a vote for war. War is not peace and love. 1) An article like this that doesn’t even mention genetics is too embarrassing to spend much time on. Summary: School achievement is at least 50% genetic. So, unless you control for this effect, it will hard to tease out the independent effects of income/spending. 2) But there is a lot of great data here! Economics/statistics majors looking for a good senior thesis topic should dive in. 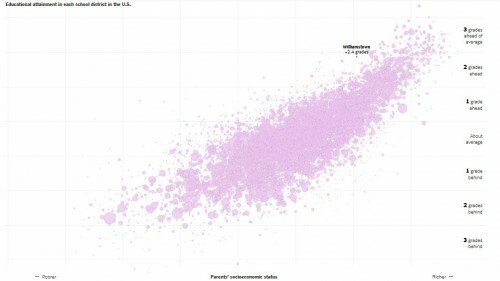 3) Williamstown is an interesting outlier. I bet that lots of college towns are above the fitted line, meaning that the students do much better than a simple measure of SES would suggest. 4) There is endless complaining from the faculty/administration about the quality of Williamstown schools, followed by demands that Williams spends its own money to help. This is natural, in that parents complain about the local schools everywhere. But it is also absurd because, in comparison with other towns to which Williams employees might conceivable move, the Williamstown schools are much better. Williams College should spend zero dollars on the local school system. An Eph has been hired to replace longtime Williamstown Town Manager Peter Fohlin, who recently retired. Jason Hoch, celebrating the 20th anniversary of his graduation from Williams College, was named the unanimous choice of the Board of Selectmen on Friday. Hoch was a Political Economy major while at Williams, and his work there put him on the road to Spring Street. As a senior, his thesis was entitled “Crisis on Main Street,” examining downtown Adams about two years after the opening of Walmart near the North Adams/Adams border in September, 1993. In the thesis, Hoch applied Albert Hirschman’s “Exit, Voice, and Loyalty” framework, a longtime linchpin of the Political Economy curriculum. Hoch, Littleton’s town manager, has worked hard to make his town inviting to pedestrians, and he’s eager to show off some of the recent innovations. Before him, a red-roofed bridge stretches across the water. The sign over the entrance reads “2004,” the year the federally funded bridge opened. On his walk through Littleton, Jason Hoch ambles on the western side of the Ammonoosuc, along a gravel trail the city developed last year. Green and quiet, aside from the burble of the river, it’s hard to imagine that the interstate is a fraction of a mile away. This side of the river hosts a farmers’ market every Sunday. Hoch is proud of what the town has accomplished. He said one example was an addition of ground-speed salt dispensers to Highway Department trucks, which he recommended to road agent Jack Pinciaro. The electronic dispensers measure the speed of the truck and lay down the appropriate amount of salt. “It was something I saw in my years in Littleton, and it makes work easier and saves us money,” he said. 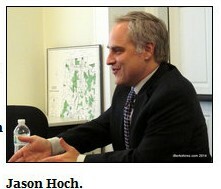 Hoch said he also brought in “a completely different approach” to the town’s budget system. He reviewed the original proposal by the Budget Committee and then made adjustments and cuts that went beyond their recommendations. The process brought praise from taxpayers and town officials. “That’s always a good validation that you’re in the right direction,” he said. Other highlights from his first year include helping to negotiate a new police union contract, renewing the town’s cable franchise agreement and developing a more efficient financial system that led to the town’s “clean audit” this summer. More recently, Hoch helped update Litchfield’s personnel policies, improved efficiency in the town roads department, and helped the town establish an annual “Winterfest” celebration. Jason, Welcome back to the Purple Valley! May the town/gown divide ever be lessened with you on the town side. We all hold different images for places that are important to us. What might yours be? Pete Scerbo, who represented The Springs Pool and Spa’s owner, Amy Patten, said the business won’t operate this summer during a meeting of the Community Preservation Committee Tuesday night. “At this point in time, we’re not going to be opening the pool. It’s something we’re not taking on this year,” Scerbo said Wednesday morning. The business’ website states it’s closed and up for sale. The current owners took over in 2003 from the George family, which had owned it since 1950 and operated it as the “Sand Springs Pool & Spa.” And the 74-degree lukewarm springs have been a public ammenity for much longer. According to the Depression-era Federal Writer’s Project’s Guide to Massachusetts People and Places, Sand Springs Pool had a bathing hut erected “as early as 1800,” and “had been used for hundreds of years” by Native Americans before the settlement of Williamstown by Europeans. When I was a student, Sand Springs Pool was a popular stop among local businesses on the advertising solicitation rounds. But because Williams has long had its own recreational facilities, Sand Springs Pool has rarely loomed large in the minds of students. (it’s a separate business, the Sand Springs Bottling Company, that has provided Williams students with ginger ale, club soda, and bottled water). Photo by John Phelan, licensed under the Creative Commons Attribution 3.0 Unported license. Signs posted in the entrance way of The Store at Five Corners on Monday stated the store would close at the end of the day on Thursday, Jan. 6, for renovations and reorganization. Lewis said a large enough sum of money had been lost that made it prohibitive under the present course and former leadership to continue operating the businesses. “Essentially there is no question that financial issues make it ridiculous to continue on our present course, and that is why there needs to be a reorganization. It needs to be essentially a regrouping in order make the businesses viable,” he said. Two South Williamstown icons — Green River Farms and The Store at Five Corners — are closing. These two, especially The Store at Five Corners, are local and regional icons — I hope a new owner can find a way to make them financially viable. An occasional visitor when I was a student, I’ve frequented it much more as an alumnus, and it’s a vital part of the identity of South Williamstown. Link to topix debate- Great stuff! Town and gown! 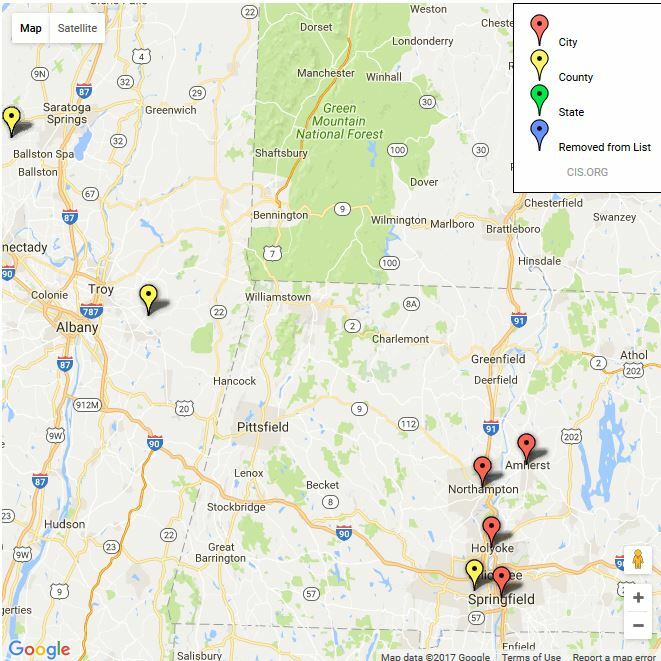 The Williams College heating plant particulate emissions ranking in the Commonwealth of Mass,with 0 being cleanest,and 100 being dirtiest in the state, is 90. What exactly is the emissions data from the college power plant, how much growth in use has there been in the last decade? Why be for biomass and other local fuel sources? It’s the war, stupid! Comments Off on Is this statement true? Here’s more on the controversy raging over the proposed Pownal biomass facility about which David previously posted. The plants will be 29 megawatt, baseload plants. Unlike wind and solar, which provide intermittent power, these facilities run all the time, significantly improving the stability of the power system and reducing the cost for transmission by utilizing the existing power lines rather than creating the need for new transmission lines. Beaver Wood’s projects will create approximately 50 renewable energy jobs at each facility and produce 100,000 tons of the highest quality pellets for commercial and home use. The plants will also provide an estimated 1,000 indirect jobs including construction and many for loggers and forestland owners. The projects will use carefully harvested waste wood, helping Vermont nurture it’s forest economy. We are banding together to demand that we are given the respect we deserve as citizens and taxpayers to have a time to complete a full review of the proposal as serious concerns have arisen related to air pollution, water use, public health and safety, traffic, aesthetics, natural environment, and historic preservation as well as the direct impact on abutting residential homes and neighbors, real estate values, and the local agriculture/farming community. Burning wood to generate electricity emits carbon monoxide, nitrogen oxides, ash, particulate matter, and volatile organic compounds. The facility will need up to 400 gallons of water/minute from the Hoosic River or from an underground aquifer supplying water to the Pownal Water District. It has been estimated by the developer that the biomass facility would require the arrival of 96 trucks per day, back and forth, down Rt 7, Rt 346 and Rt 2. Area residents packed into Griffin Hall at Williams College on Thursday night in hopes of getting some answers to how a biomass plant proposed for Pownal, Vt., would effect the region. The answer: No one really knows. At least not this early in the permitting process. Do not allow the promoters, lawyers and executives (none of whom will live in the vicinity of this plant) to sell you on a pipe dream of clean air and lots of jobs without first insisting on hard economic data and objective scientific proof from totally independent sources not on the company payroll. The science is there about the negative health effects and the history is there of prior failed economic prosperity and growth. I wonder if Selim Zilkha ’46, namesake of the College’s Zilkha Center for Environmental Initiatives, has a different take from his position as co-owner of Zilkha Biomass Energy? The proposed site in Pownal is approximately one mile from downtown Williamstown, Massachusetts. Whatever occurs in Pownal will be felt in Williamstown, Mass., and vice versa. Biomass power plants have faced opposition in cities and towns across America, not only in Pownal, including in Florida, Texas, Oregon, Wisconsin, and Indiana. Williams Record review of the New Purple Pub here. What once made the original Pub a great venue is that the bar was an unapologetic dive, complete with dirty floors, burn stains and dusty license plates on the walls. The prices were cheap. Not sure about the new formula. Place looks great, and has a killer location. The review is less than raving. At long, long, long last, the Purple Pub (albeit in a new location, with a new menu, under new ownership) reopens this evening. It’s just a soft opening, with the Grand Opening slated for September 30. Billsville folks, post impressions and photos! by voting in the final round of America’s Favorite Art Museum (aka, the art museum with the most effective social networking) contest. Billsville can’t lose to Toledo! The Selectmen on Monday welcomed the soon-to-be opened Purple Pub but cautioned the owner and new manager that alcohol control was of prime importance. The Purple Pub, a mainstay on Spring Street for decades before going up in flames in a devastating fire three years ago, is reopening under new ownership in Mark Paresky’s $4 million retail and office development. Exactly the sort of folks who probably know all about running a pub . . .
Great article on Williamstown Town Manager Peter Fohlin. Since starting as town manager 10 years ago, one thing Peter L. Fohlin has learned is patience. “Everything else I knew,” Fohlin said Friday, during an interview at Town Hall. It was on June 5, 2000, when Fohlin first took his seat in the corner office at Town Hall, leaving his job as executive secretary to the Board of Selectmen in Tisbury on Martha’s Vineyard. Since then he has guided the town through difficult budget years, overseen several projects, helped grow the town’s relationship with Williams College and encourage professionalism and a “we work for you [the taxpayer]” attitude among town employees. “I took this job because I wanted to work in a place where I could get things done. I wanted to take the best of Williamstown and make it better, and improve the things that needed to be,” he said. Too often people come to a place because they like it, and they end up wanting to make it just like the place they left, he said. “It’s not unlike people who go to foreign countries to experience the culture and stay at a Holiday Inn,” he said. When Fohlin came to Williamstown, his priorities were the Spring Street reconstruction project, the disposition of the former Photech building on Cole Avenue, and the appointment of a new police chief. The construction of a new elementary school and identifying and fixing wastewater discharge problems at the Hoosac Water Quality District treatment facility off Simonds Road were soon added to the list. A decade later, Photech remains the only one of Fohlin’s original goals that has yet to be realized. I have observed Fohlin for several years and interacted with him a couple of times. He is remarkably competent and sensible. Do any readers know him? Williamstown is lucky to have him and it will be a sad day for Williams when he leaves. More excerpts below the break. I’m elevating this from Speak Up! — did you know the new “Bachelorette” is from Williamstown. Ali Fedotowsky, 25, is a native townie who attended Clark University in Worcester and now hails from San Francisco, where she recently left her job at Facebook to star in the latest season. Besides watching the show, you can keep up with her on her blog at People.com, but apparently not on Twitter. I’ve heard a report that there were some Ephs who knew her when she was in high school — maybe someone from the class of 2002, when she graduated Mount Greylock? Or someone who liked to graze on fajitas at Desperados? Anyone know more? Fans of the Wall Street Journal’s Saturday “Masterpiece: Anatomy of a Classic” column should be delighted to see the similar column begun in the Boston Globe last week: “Frame by Frame.” Each week, Sebastian Smee will examine in depth a single piece of artwork in New England. Who is this actor strutting his stuff, with his swept-back hair, his oversized ruff, his fashionably slashed sleeve, and his gleaming, hilted sword? He’s all dash, all bravado. And yet look at his ravaged face, his red nose, his collapsing cheeks! If this is a warrior, he has “failed exploits’’ written all over him. Fragonard, who made the color yellow sprightlier and saucier than any other artist before or since, was a student of Chardin and then of Boucher in that most pastel-colored of centuries, the 18th. He did not live up to his potential, which is part of what we love about him. Does anyone at Williams still read The Globe, in print or online, or do people just read the New York Times? In the late 90s, when I was picking up my Globe at the Newsroom on Spring Street, I was told that Globe sales had declined by half in Williamstown over the preceding decade. And that was really before the catastrophic collapse for newspapers everywhere that has happened since. In any case, those in Williamstown, Boston, and elsewhere in New England should follow along with Smee’s romp through the “endlessly stimulating” permanent collections of New England’s art museums. It ought to inspire some great weekend trips. Route 2 is a major State highway, but when you are in Williamstown, about every 10 feet or so, students cross in front of moving cars in a “Night of the Living Dead” detachment, totally oblivious that there is in fact, actually moving traffic on the road they are directly stepping into and stalking across. Their total lack of courtesy and caution, coupled with the straggled entry of the many numbers of them onto the street, can delay and frustrate even the most patient and careful of drivers. 10 points on your license for each one you take out, which F-150 Trucks and cars with Vermont tags are quite tempted to do. This generates road rage that will rear it’s ugly head in other areas of driving in the Berkshires. Indeed. In my experience, Vermont drivers are the most homicidally insane (or insanely homicidal) drivers on earth. Almost invariably, whenever a car on Rt 2 nearly ran me or another student over, it would bear the green plates of the Green Mountain State. They made the New York and Massachusetts drivers look positively courteous. The Church on Church street is currently in the early stages of being converted into apartments. Evidently started in a new house under construction. Pownal, Lanesboro and other fire departments reported on scene. Seems under control but large. 7:17PM: Fires seem out (good news). Bad news: evidently there were several branching fires, and a Professor lost a home-in-progress. (More news as available). Boston radio DJ (and MCLA grad) Mike Hsu recently posted a great blog entry reminiscing about his time working at Toonerville Trolley on Water Street. I, too, lament the slow and inexorible death of independant record stores due to Itunes, Amazon and the like, but I must confess to frequently succumbing to the ease and flexibility of online-purchasing (which is not only killing record stores, but also — albeit more gradually — albums). Toonerville, and Hal, are Billsville treasures, and it is good to hear both are still going strong. If you are looking for a hard-to-find album, consider ordering from Toonerville’s online store, or better yet, drop by the next time you are in Williamstown. Anyone have any memories of great Toonerville finds? Massachusetts’ Office of Travel and Tourism is creating a list of 1000 great places in Massachusetts. Which places in the Williamstown area would you nominate? Certainly, Stone Hill, Pine Cobble, the Williams campus (or if that is too broad a designation, Thompson, Chapin Hall, the Chapin Rare Books Library, the WCMA, Mission Park — the park, not the building), the Clark, the WTF (if that is considered a “place”), Mount Greylock, and in North Adams, MassMoca and the Natural Bridge State Park, all warrant consideration. Comments Off on Local Great Places? EphBlog is powered by WordPress and delivered to you in 2.060 seconds using 59 queries..